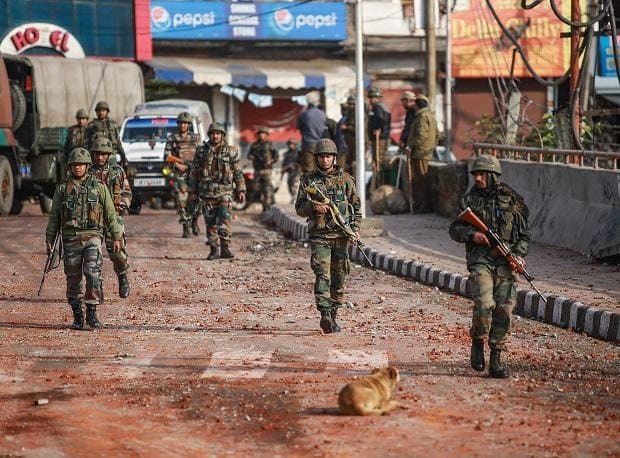 Army personnel patrol a street during a curfew, imposed after clashes between two communities over the protest against the Pulwama terror attack, in Jammu, Saturday, Feb. 16, 2019. Pakistan Prime Minister Imran Khan on Thursday authorised the military to "respond decisively and comprehensively to any aggression or misadventure" by India, amidst heightened tensions between the two sides following the Pulwama terror attack that killed 40 CRPF soldiers. Days after the terror strike by Pakistan-based Jaish-e-Mohammad terror group in Jammu and Kashmir's Pulwama district, Prime Minister Narendra Modi said security forces have been given free hand to avenge the dastardly act. Prime Minister Khan, who chaired a key meeting of the National Security Council here on Thursday, said the Pakistan government was "determined to demonstrate" that it is capable of protecting its people. The country's top civilian and military leadership said that "Pakistan is not involved in any way, means or form in Pulwama incident and it was conceived, planned and executed indigenously", according to the statement. It said Pakistan has sincerely offered investigation of the "incident" and dialogue on the issue of terrorism among other disputed issues with India. "We expect India to positively respond to these offers," it said, adding that based on the investigation or any tangible evidence provided, Pakistan shall take action against anyone found using its soil. The NSC urged the global community to play its part in resolving the Kashmir issue. In a video message on Tuesday, Khan assured India that he would act against the perpetrators of the Pulwama terror attack if New Delhi shares "actionable intelligence", but warned against any "revenge" retaliatory action. India rubbished Khan's comments, saying disclaiming Pakistan's link with terrorist attacks is an oft-repeated excuse by the "nerve centre" of terrorism. In a statement, the Ministry of External Affairs in New Delhi on Tuesday said India was not surprised that Khan refused to acknowledge the attack on India's security forces in Pulwama as an act of terrorism, adding his offer to investigate the attack if provided proof is a "lame excuse". Ahead of the NSC meeting on Thursday, Prime Minister Khan and Army chief Gen Qamar Javed Bajwa held a one-on-one meeting during which they discussed region's security situation. Khan also directed both the interior ministry and the security institutions to immediately accelerate actions on ground to ensure that militancy and extremism are routed from the society and the country.